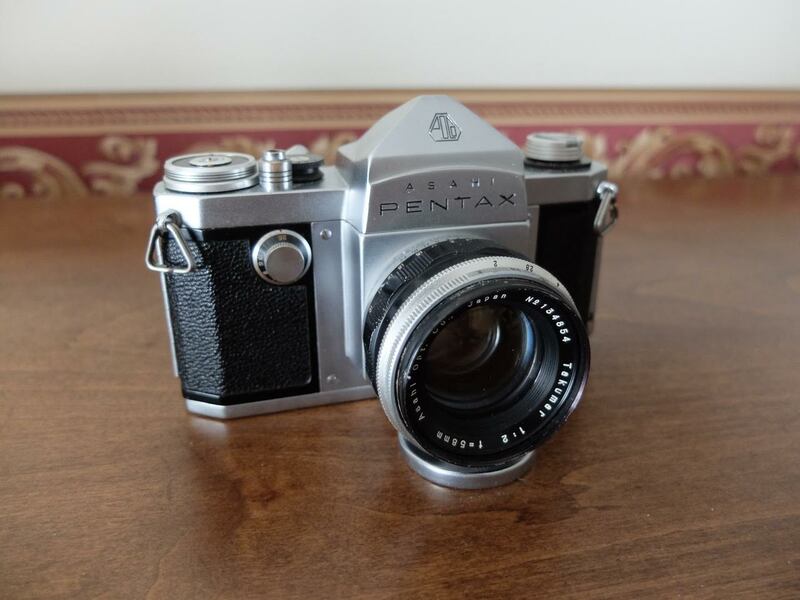 Upon return of my first Pentax AP (the first Pentax M42 screw-mount SLR marketed in US) from Scott Hendrickson’s outstanding CLA service, one of my first thoughts was that this might be very close to what Oskar Barnack would have designed, had he been compelled to design an SLR. This impression did not come from merely the obvious similarities in the way shutter speed is selected – not to mention the fact that maximum shutter speed is 500 – but comes from the feel of the advance lever, the sensation of the shutter release, the sound of the shutter, the solid feel; the overall gestalt of construction and mechanism. 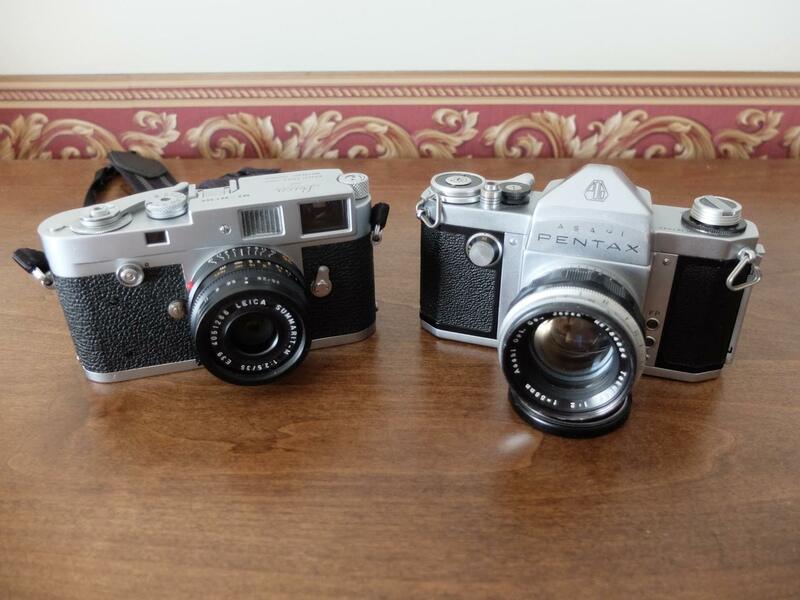 It is as if someone very knowledgeable and satisfied with the design of a rangefinder put it to themselves: “how can I best design a camera with the advantages of SLR focusing, but retain as much of the rangefinder camera convenience as possible?” And in doing so they rendering a masterpiece. The chrome finish is very similar in appearance and feel to my Leica IIIc and IIIg. The tension and overall smooth feel of the film advance lever is very similar to the M2…but not nearly as long in stroke. The shutter, although a bit louder – and I mean “a bit“ – has the same general sound as an M camera. Nothing rattles; whether cocked or not, it feels and behaves as though chiseled out of a solid block of metal; furthermore, exclusive of the prism hump, the overall size and weight of the camera is about the same as an M2. The view through the finder is enough to make any nostalgia buff smile: the central region is a large ground glass area surrounded by fresnel rings…that’s it; reminding very much of the focusing screen of a Hasselblad 500C.…. No lines, needles, LED light; no numbers, lettering or anything else to distract you from the various parts of the scene that magically fades in and out of focus as you compose. Again, to stick with the main comparison, it is as close to the simple magic of a rangefinder patch as is possible with an SLR prism arrangement. The camera is doing nothing for you; you experiment, moving your eye toward and away from finder window, finding what works best for you….making the experience entirely your own. Any improvement in result will come purely from improvement in your skill and effort. If I may …. an exposition on an aspect of OVF (optical viewfinder) not often expounded upon in the great OVF vs. EVF debate: that being, the EVF robs you of some cherished moments with the unique characteristics of fine old glass – or even, fine new glass. With EVF, you never do actually get an opportunity to view the world through the lens. With Pentax AP, you do get this opportunity, and in the most raw interpretation of the act. Even if the photograph does not turn out exactly as you envisioned, and you walk away without the prized, perfect image, you still have the view, the joy, of that vision in your head. You were there. You saw it through that magical Zeiss 50mm 1.4 Planar….. With an EVF, well, you watched the video. On the subject of lenses, this is another aspect of the AP that will sit well with those used to rangefinder photography. While not as small as the delightfully tiny and lightweight lenses used on a Barnack Leica, they are small. The AP, packed with Pentax M42 55mm f2, 35mm f4, and and 105mm f2.8 does take up more room than my IIIC with comparable lens set, but can be packed- with IIIC, including comparable lenses- in my Domke F-5XB……a shoulder bag not much larger than my shaving kit. Oh, and there is still room for the superb, and cheap, M42 Takumar 50mm 1.4 – if you feel the need for a fast lens. At this point, given the length and breadth of modern comprehensive camera reviews I have read over the past few years, I begin to feel somewhat inadequate to this task. There is not really much, beyond the sensation, i.e. “haptics,” of use to expound upon. it is, quite literally, in substance, nothing more than a metal box to facilitate: storage and advancement of film; manual focus of lens; selection of shutter speed, and activation of shutter. But for a mechanism of that type, it is superb. There you have it: spartan in feature; elegant and solid in design; able to stand up to the test of time; convenient in size and weight; unobtrusive and fulfilling in operation. I am pretty sure Oskar would have liked it. OBTW, I own two. One came with a Takumar 58mm f2.4 lens attached, the second came with the Takumar 58mm f2.0. In both cases, camera and lens, together, resulted in a raid on the family treasure of about half the value that either of the lenses, alone, would normally demand. If you see one for sale, pick it up and give it a fondle. This entry was posted in Collectible Leicas, Film photography and tagged Asahi Pentax on July 14, 2016 by Leicaphila. I understand your love; I felt like that about my Nikon F, one reason I didn’t buy into Leica M cameras. The beauty of the image on a ground glass screen truly is visceral. Not to mention 100% viewfinder coverage of captured area, which I don’t think Pentax offered and rangefinders don’t. Regarding the difference between OVF finders and EVFs, there’s as powerful a difference between manual focus and autofocus: focussing a manual lens, especially a longish one, is an experience that’s beyond just photographic: you can almost taste distance as the planes change whilst you’re turning that ring – it’s a visual experience, not just a rapid in/out of focus. Yes, there’s more to photography than pictures; often, the journey and the vehicle are more rewarding than the destination. Only to chime in with an echo of agreement. I was blown away and utterly charmed with a Spotmatic SP for all the reasons you touch on. Embarrassingly cheap at a garage sale and yet those hard to describe intangibles that contribute to the Leica myth are there in spades. Heck, I’d go one further and suggest that the enjoyment derived is equal if not surpasses my ol’Leica M4-2 and 35mm Summicron with an aperture ring that squeaks! I applaud the comparison. Well played and daringly apropos. The Spotmatic was an amazingly well-made precision device. And it was about as compact as you could get for a 35mm film single reflex camera (the Olympus OMs and Pentax ME/MX were a bit smaller). I think the Spotmatic was closer to the Leica ethos than the much bulkier and heavier Leicaflex models. We still have in the household a Spotmatic that my wife bought in 1971 in Boston, Massachusetts. Optical quality with the 55 mm f/1.8 Takumar lens is great. The stop-down exposure meter is fine with the genuine mercury batteries. I think one omission the designers made was to not include a mirror lockup control.